United States, India, Germany, Iran, Vietnam & Singapore are where most visitors come from. Topics: Events, For Post-doctorate Studies, For Graduate (phd) Studies, For Undergraduate Studies, & For Secondary/high School Students. 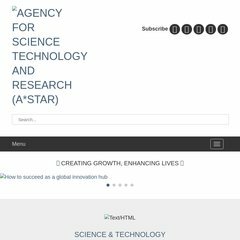 corefac.imcb.a-star.ed.. Scientific Computing @2011 - Agency for Science, Technology and .. The site has about 3,393 users daily, viewing on average 3.30 pages each. ns2.a-star.edu.sg, & ns1.a-star.edu.sg are its DNS Nameservers. The programming language environment is ASP.NET. It is hosted by A*star (Singapore, Singapore,) using Microsoft-IIS/6 web server. Its server speed is measured at 914 milliseconds.